With your hands to yourself. Remove permanent marker for lamination of any type. Dampen a Mr. Clean Magic Eraser cleaning pad, rub over ink, and it will disappear. Have a certain amount of parents you call per week. Say 5 parents. You call those parents and ONLY speak of good things about the child. Everyone receives FREE labels in the mail. Use those to labels on your personal items. If they are loaned out or borrowed, people will remember who the item belongs to. Young children have trouble squeezing the glue to hard. My saying was "Just a Dot Not a lot" it really helped, and we said it over and over all year long! You can also have them dip cotton swabs into the glue so they don't use too much. Soak old crayons in water to remove the paper. Let them soak and then paper will peel off. Purchase dogs dishes for painting projects, OR anything you don't want to spill. Dog dishes refuse to tip over if bumped! Did Someone forget their backpack? Find a plastic container, or make one out of a milk jug, or a cute bag, into something cute such as an elephant, or person, with a hole cut for the mouth. Keep plastic Wal-Mart sacks so children always have a bag to take home with them. When doing a messy project use fitted crib sheets over tables. They are perfect for smaller tables. You can also use flannel backed vinyl table clothes. Paint will dry and wipe right off. I bought this box at Office Depot very cheap (Clearance) as a teacher I was always trying to collect and keep in a pile what I was going to assess each student on and when. With this box there are 4 different compartments you can store things in such as manipulatives. You can put the child's (or children) name on the box you are going to assess. 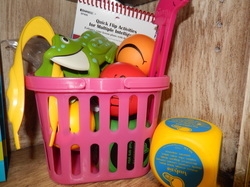 We all have children on different levels, this box allows you to stay organized. We all have cheers, poems, songs, and chants. Print them off and bind them. Keep them at your carpet or wherever you use them. Have a special little basket to keep you organized! when I can find little baskets cheap I buy them. 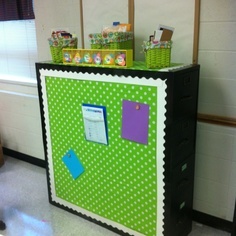 You can have individual baskets that are themed to organize your "teaching stuff" in! Label everything! If you label your containers it will be so much easier to grab, or to have a substitute in your classroom. Sometimes I have students bring old socks to use for erasers when we use dry erase markers. 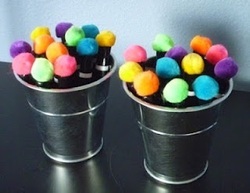 For this idea, you glue pom pom balls on the end of the markers, so children OR YOU can erase! This is a horseshoe table with crates for chairs. The crates have soft pillows that were made to fit the top. 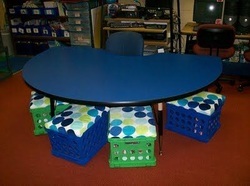 The crates work well for children to sit on, and the seats come off for storage! This is a really good idea for teachers who are busy and have a hard time remembering what to tell students at the end of the day etc. 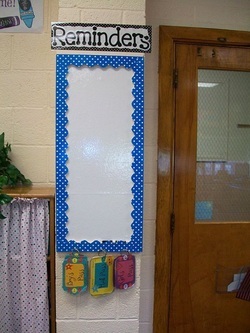 Keep a white board with a fun border around it by the door. Write names, or notes to remind you of things you may forget! Here is another way you can use a horseshoe table. 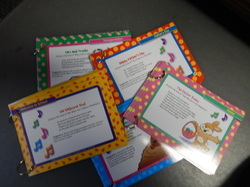 Many times we are working with small groups of children. 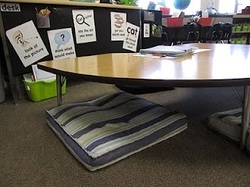 If you put the table down to the lowest point children and the teacher can sit on pillows. It is just something different, rather than sitting in a chair. 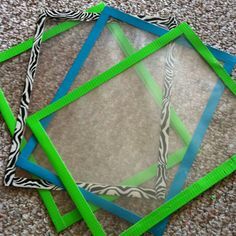 These are clear report covers with sides taped with decorative duct tape. You can leave one side open if you want to put papers inside. Use dry erase markers! Clean and reuse.